Hobby Lobby sequel: Fifth Circuit rejects Obamacare contraceptive mandate lawsuit. 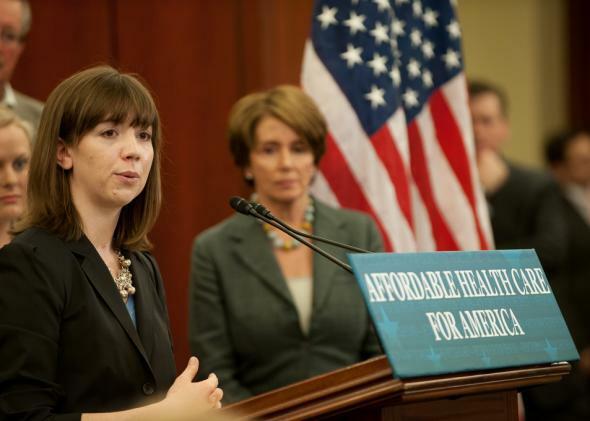 A press conference in support of the Affordable Care Act. A challenge to the law’s contraceptive mandate was rejected on Monday. On Monday, the Fifth Circuit—one of the most conservative appeals courts in the country—rejected a challenge to the Affordable Care Act’s contraceptive mandate in an opinion written by Judge Jerry E. Smith—one of the most conservative federal judges on the bench. The challenge, brought by nonprofit religious groups, claimed that the mandate violated the Religious Freedom Restoration Act (RFRA) by forcing these groups to sign a form that would eventually allow their employees to access contraception. In a concise, emphatic opinion, the court ruled that the mandate complies with RFRA. Although the challenge relies on the same law used in the Hobby Lobby case, it differs in crucial ways. In Hobby Lobby, for-profit corporations objected to the mandate’s requirement that they provide employees with insurance coverage of contraception. The court held that this requirement substantially burdened Hobby Lobby’s exercise of religion, in violation of RFRA. Here, however, religious nonprofits are not being required to provide contraceptive coverage to their employers. Rather, they need only submit a form or notification announcing that they refuse, based on their religious beliefs, to provide such coverage. Once they have, their insurer will be directed to provide separate payments to women who desire contraception. Although the plaintiffs have identified several acts that offend their religious beliefs, the acts they are required to perform do not include providing or facilitating access to contraceptives. Instead, the acts that violate their faith are those of third parties. Because RFRA confers no right to challenge the independent conduct of third parties, we join our sister circuits in concluding that the plaintiffs have not shown a substantial burden on their religious exercise. This logic is ripped directly from Justice Anthony Kennedy’s Hobby Lobby concurrence, which tempered Justice Samuel Alito’s majority opinion. Kennedy explained that RFRA claims might fail if the asserted religious exercise burdened a third party’s ability to exercise her own rights. And that, pretty clearly, is what’s going on here: These religious organizations are essentially asserting that RFRA protects their ability to forbid their employees from accessing contraceptive coverage. Five appeals courts have now firmly rejected this reasoning. And until a court rules the other way, the Supreme Court will probably refrain from wading into the controversy.